There are some fields left open to be added by the player… any suggestions? While some of the words are maybe not that new anymore, many are very new. Some of them are more related to architectural questions, some are more test related, but with an overall quality approach I assume both is relevant. So test yourself: do you know all the words and can explain them? Even to your manager? I think we should play this at some point in time at one of our meetups, with someone explaining the quality approach of his company in 3 minutes, and the others ticking off the words… and those words not covered we should try to explain eventually. 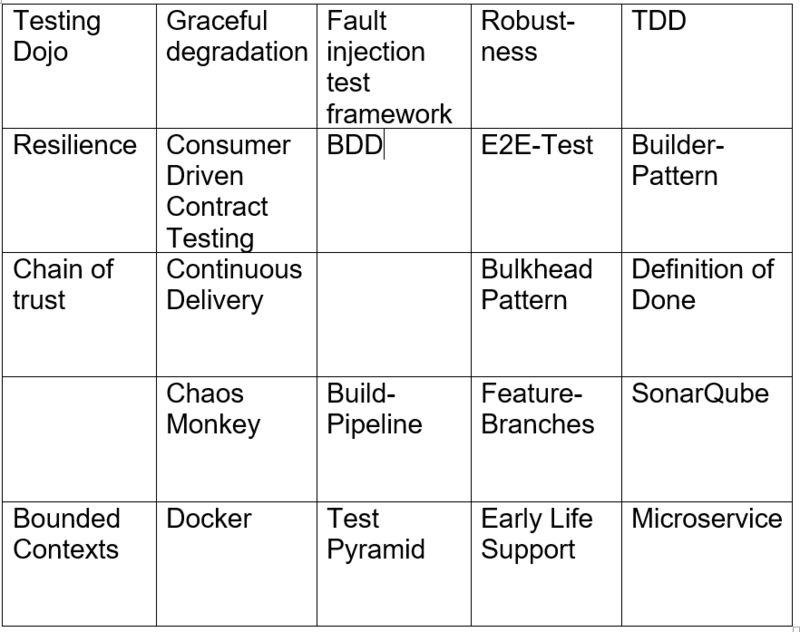 Anybody interested in supplying more QA bingo cards? A really nice sample of buzzwords. What about filling “Exploratory Testing” in one of the empty fields. And there is a very old one, still used frequently, especially in discussions with the management: “Test Coverage”. Given five stakeholders in a project, you will get at least seven definitions of Test Coverage! I would love to play that game, will be great fun. Hi Hanne, we will play something similar on Quality Games Night. But not on base of Bingo, but “Tabu”. Make sure you come.